Places Covered : Delhi - Udaipur - Narlai - Rohet - Jodhpur - Jaipur - Bharatpur - Fatehpur Sikri - Agra - Delhi. The Rajut Kings left their mark on this wonderful land in the from of magnificent palaces, citadels and forts. The result is a colorful Province boasting some of the country's most glorious sight and charming retreats. To experience the wonder of this golden age, we have created a tour based around the celebrated Heritage properties of the region. Conversions have been sympathetically undertaken, with the properties keeping their royal ambience. The atmosphere is that of a country guesthouse and many are still owned and run by the former ruling family. Part of the charm of these properties is that no two rooms are alike, although modern facilities are available in the rooms, it is the romance of a bygone age that leaves the lasting impression. The tour features comprehensive sightseeing at a relaxed pace. Most of the internal travel is by road and rail allowing us the opportunity to enjoy the scenery and local life en route. 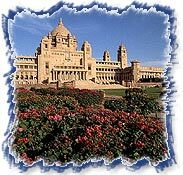 As the drive from Delhi to Udaipur is long, we have chosen to fly.The tour represents extremely good value that would outshine similar tours. Arrive Delhi. You will meet our representative and transfer to hotel for overnight stay. Today, leave for sight-seeing tour which includes Jama - the largest mosque of Emperor Shajahan. Later proceed Red Fort Raj Ghat- Cremation site of Mahatma Gandhi, to India Gate - a 42 meter stone arch built in the memory of the Indian Soldiers who died in World War II, Driver past the President's House & Parliament House, Humayu'ns Tomb a memorial by the Taj Mahals, the Qutab Minar, Brila Mandir and Lotus Temple. 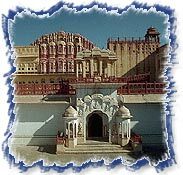 In the Morning fly to the romantic city of Udaipur and transfer to the Hotel. The afternoon is free to relax in the well - kept gardens on this 19th century palace or by the swimming pool. Built for the Maharana to watch the major processions in Udaipur, its rooms are a blend of Rajput and European Styles. Morning tour of the magnificent City Palace and the temples of Eklingji and the less frequented Ngada. The afternoon is free to relax. Drive through the Aravalli Hills to the majestic Kumbhalagharh Fort. Perched high above the palins. We lunch at the secluded Aoundhi Retreat. Descend from the hills to the religious village of Narlai (160 kms/ 4hrs) and stay at the charming Rawla Narlai, a converted former hunting lodge of the Maharaja of Jodhpur. Morning visit to the superb 15th century Jain temples in the quiet wooded valley of Ranakpur, one of the five Jain holy sties in India. Afternoon walking tour in the village of Narlai, where we are free to wonder around this fascinating village of artisans. Morning drive to the Picturesque hamlet of Robet. The afternoon is free to explore the village of this Bishnoi community. We Start today with a village safari in the area surrounding Rohet. Later drive to Jodhpur ( 40 kms / 1 hours) and check into our hotel. Morning tour of Jodhpur, including the imposing Meherangarh fort with its palaces and outstanding museum. Afternoon is free to explore Jodhpur further or relax at the hotel. Early Morning train to Jaipur (about 5 hrs. journey). An afternoon tour encompasses the City Palace, its museums and famed 18th century observatory, and elegant Place of the Winds. We explore the medieval fort at Amber, which was the ancient capital of the Kachawha Rajputs. The afternoon is free to explore the " Pink City" further or relax in the atmospheric courtyard of our hotel. Morning drive (176 / 3 hrs) to the Bharatpur Bird Sancturary. The afternoon is occupied with viewing the abundant bird life. Drive to Agra via the ghostly Mughal City of Fatepuhr Sikri, once the imperial capital (56 kms / 1hrs). Later visit Taj Mahal - one of the seven wonders of the world, Itmad-ud-Duala and Sikandara. Overnight in hotel.